Never Crawl Through Your Home’s Crawl Space, Again—Let Your Eyes Do the Crawling For You! You know that you’re supposed to do it at least once a year, but the thought of crawling around your home’s foundation makes you cringe with procrastination. There’s spiders, dampness, and a host of other unpleasant varmints waiting to greet you. Not to mention the confinement of tight spaces that are inherent with most house crawl spaces. Take arm against this dreaded annual inspection task with a tricked out remote control tank. Equipped with a high-resolution infrared (IR) video camera this RC Home Inspector is able to drive up to any point of interest and transmit a clear video signal of your home’s foundation…even in pitch darkness. When your yearly inspection is finished, just drive the tank out from under your house, wipe everything off, and store your RC Home Inspector in a handy bag until next year. Cut off roughly 6-inches of barrel length from the tank’s turret. Keep the IR “gun” inside the barrel for boosting your IR video camera’s forward vision. Open up the tank and remove the internal speaker. While the tank is open, drill two holes in the rear body plate. 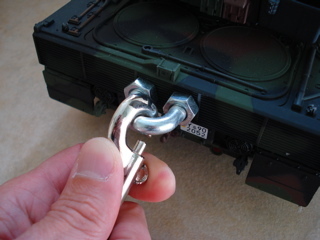 Install the 5/16-inch cable retainer and close up the tank. Tie the multi-purpose cord to the 3/8-inch swivel eye bolt. Use a bowline knot (you can find tying instructions for this knot here. 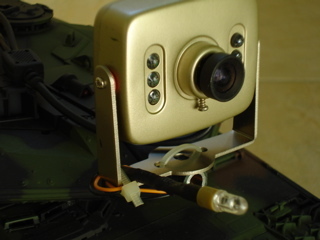 Mount the IR camera to the tank’s barrel. Connect the 12VDC power supply to the camera. 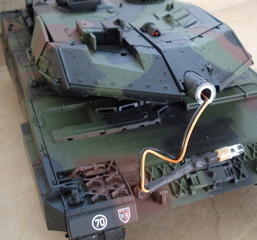 Install batteries in the tank and the RC transmitter. Connect the outdoor extension cord to the 12VDC power supply and plug one end of the video cable into the IR camera and the other end into whatever you're using to monitor the video (like a small portable television). Attach the 3/8-inch swivel eye bolt to the 5/16-inch wire retainer, turn on the tank and RC transmitter, and drive inside your home’s foundation crawl space. Aim the IR camera with the turret and barrel controls on the RC transmitter. Record distances under your house by measuring the amount of cord pulled by the tank. And if the tank’s batteries die, just pull the tank out with the extraction lanyard. Why isn't the builder's toolbag optional? This is a very practical little project. When the soviets needed to look deep inside Chernobyl, they didn't have the budget for an expensive robot. 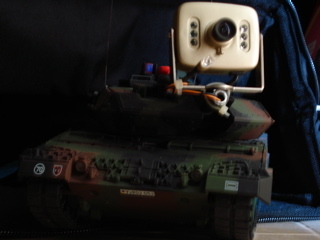 One of the scientists on site bought a toy tank from a gift shop and strapped a camera to it.